Homeschooling during the holiday season can be tricky. This will be our 7th Christmas while homeschooling and I've learned a few things along the way. I hope these tips will be a blessing to you. I remember that first holiday season. We tried to do way too much and keep up with a rigorous curriculum schedule. It ended with lots of tears on their part and mine. The following year I had a much better strategy. Around the beginning of November look at your school schedule and see where you are. This is about when I decide our school break. (If you schedule ahead of time for the year this is a good time to see how far you've progressed). I decide how much we need to get done for the rest of the year. If you haven't - pick your last day of the school. For us this has varied. It really depends on how much we accomplish for the first few months of school. Typically I try to only do 2 full weeks of school from the last week of November through until the new year. This is just pertaining to our actual curriculum and not any fun stuff. I find that much past the 15th of December we get busy with outings and family obligations. Plus decorating, shopping, wrapping - it all takes time and school gets pushed off to the side anyways so we plan for that time off. I always set time aside for crafts, meeting friends, parties and lots of social events. We usually have a big day at the nursing home where the kids sing through the building. There is a craft outing for my younger kid. We also meet up with friends for homeschool Christmas parties. We put aside some books and read lots of holiday books. We watch all our favorite Christmas movies. I want there to be plenty of fun and memories come December. Baking cookies, wrapping presents - it all counts as learning! Last year we only got around to making 2 kinds of cookies. That may sound like a lot to some of you but typically we make 4 varieties on a slow year. However time flew and we had a long vacation in November so we ended up schooling a good part of December and just frankly ran out of time. I was very stressed at first. Oh the kids will be disappointed... but really it didn't matter. We had chocolate chip cookies and butter cookies and it was FINE! Don't get so crazy with schooling and the hecticness of the holiday that you neglect sleep and down time. This is a sure fire way to catch a cold. When you get run down your body can't fight off those germs as well and that is the last thing anyone needs during the holiday. As the end of the physical year progresses I find that my kid's minds wander a bit more. One way I help them is to do a lot of verbal work. We let them answer the written work verbally and even do some test and quizzes that way. I've even done an open book test on occasion. (Hey - I had those in public school!!) This helps take the stress off of them too. Believe me the kids feel the stress and appreciate any lightness we can bring to the day. I also tend to pare down what is required. Frankly we keep it basic with math, history, science and English. All extras get dropped after Thanksgiving and resume in the New Year. Kids are only little once! I am giving you permission to skip that spelling list or at least postpone and not finish for the year. Believe me there are other important things they are learning by baking cookies with Mom or visiting an older family member. Remember it isn't always academics we are striving for but character as well. 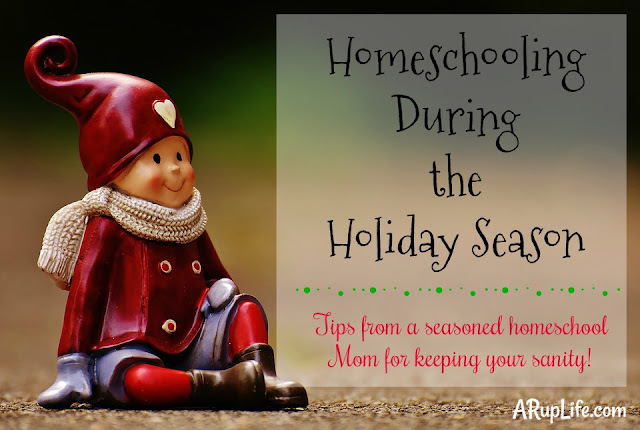 Do you have a Tip for Surviving Homeschooling during the holidays?